Your Partner in a Healthy Lifestyle! 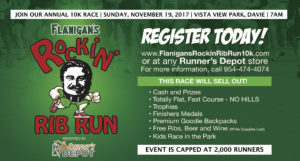 Get ready for the 5th Annual Flanigan’s Rockin’ Rib Run 10K! Sunday, November 19th @ 7:00AM will be another exciting, fun-filled event presented by Runner’s Depot! 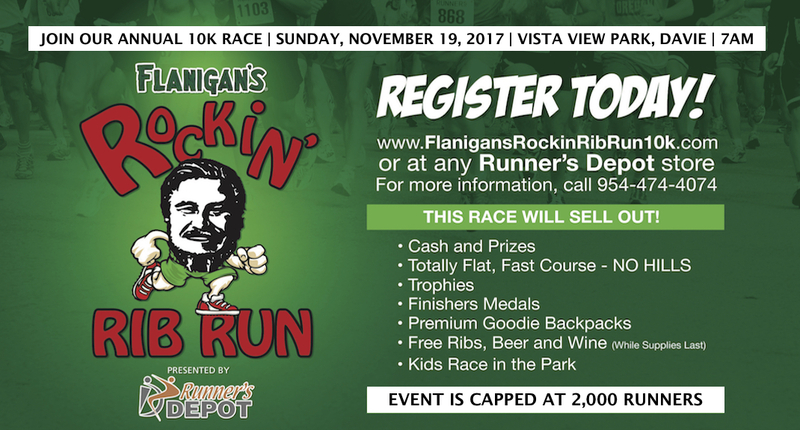 FREE BEER, WINE & AWARD-WINNING BABY BACK RIBS for participants – compliments of Flanigan’s! COURSE: This 10K Certified Course starts and ends at Vista View Park. ABSOLUTELY FLAT! NO HILLS! The course will take you out of the park and west onto Orange Drive out and back. Finisher Backpacks with Race Tee, Towels, Water Bottle and other gifts. RRCA Florida State 10K Championship: This year’s event has been awarded by the RRCA (Road Runner’s Club of America) the honor of being the Florida State Championship 10K Road Race. Additional, special awards will be presented for those earning these titles. Race is capped at 2,000 runners and will sell out FAST! All proceeds to benefit the HOPE mission and programs of the Miami Lakes United Methodist Church.